Riders heading to downtown Cleveland on the RTA’s Red Line may have noticed quite a few more pops of color adorning the city landscape over the past two weeks. The colors have a story, and each story comes from a work or writer in the Anisfield-Wolf Book Award canon. Inter|Urban, the collaboration among the City of Cleveland, the Cleveland Foundation, North East Ohio Area Coordinating Agency, RTA and LAND studio, has filled the 19-mile stretch from Cleveland Hopkins International Airport and into downtown Cleveland with bright, vibrant murals. Coming up in time for the Republican National Convention in July will be two photo installations. All the art is inspired by Anisfield-Wolf texts and writers. 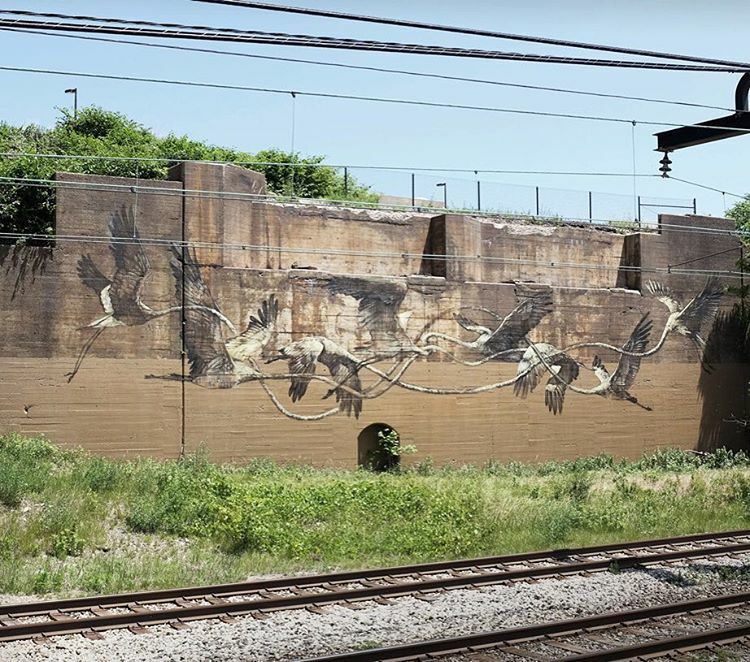 Seventeen artists from around the world converged on Cleveland in June for a public art blitz, creating an outdoor gallery and anchoring installations at the airport and Terminal Tower. Eight artists are based in Cleveland, with the others representing South Africa, Michigan, Pennsylvania, California, Hawaii, and Florida. San Francisco muralist Aaron De La Cruz drew inspiration from a selection of Dolores Kendrick’s “Sophie Climbing the Stairs,” about an enslaved woman sneaking off to read. The passage evoked a memory of his parents speaking in Spanish to keep their conversations a mystery to the young De La Cruz and his brother. Drawing off the theme of literacy, his mural features deconstructed letters and punctuation marks. INSPIRATION: The End by Elizabeth Alexander from American Sublime. 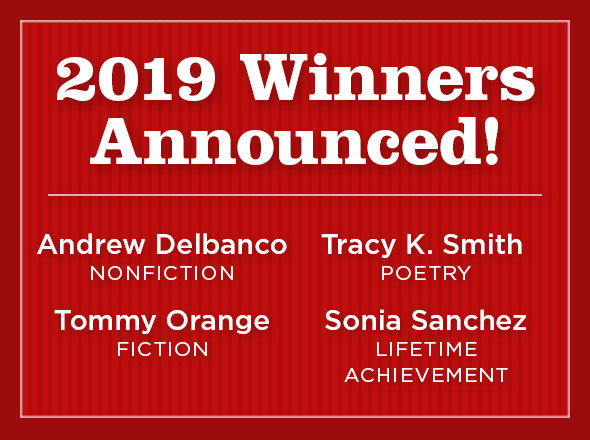 The poet won for Lifetime Achievement in 2010. Amber Esner, a Cleveland illustrator, was struck by Alexander’s ode to the dissolution of a relationship, as she lists the items left behind after a breakup. “My concept is based around the process of how people deal with loss by letting go of — or holding on to — specific objects,” she writes. Cleveland illustrator and writer Margaret Kimball drew upon Martha Collins’ White Pages, a collection of untitled poems that explore white privilege and the ongoing racial divide in America. Kimball latched on to the repetition of the phrase “Yes, but” within the poem and used a minimalist color scheme to make one word prominent—YES. “The word is inclusive and strong and in this case has no strings attached, nothing to interrupt it,” Kimball writes. 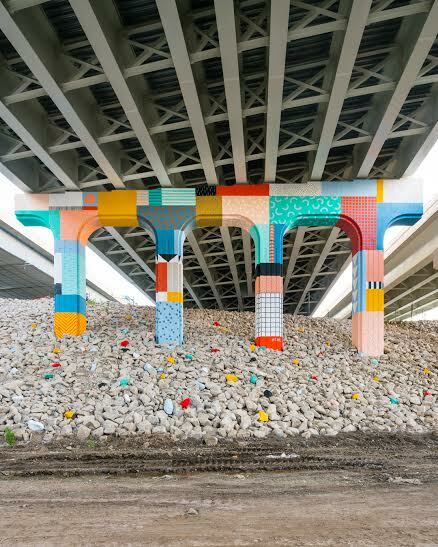 If you happen to be in the passenger seat as you’re driving to and from Cleveland Hopkins airport, take a look around to see if you can spot these 35-foot tall overpass pillars, designed by Detroit artist Louise Chen. “The totem pillars are a celebration of the way cultures represent themselves in the language of ornament, with design inspired by many different cultures spanning the world,” she writes. Cleveland artist Osmad Muhammad used his mural to make a statement about national and global atrocities. 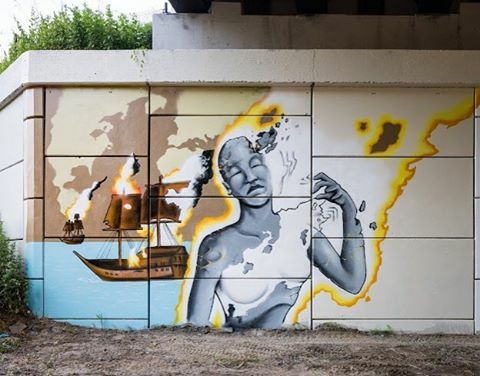 The burning woman in foreground is a reference to Hiroshima and the burning ships depict the slave trade throughout the Americas. Published in 1951, Langston Hughes‘ Montage of a Dream Deferred reads like a jazz record, full of conflicting rhythms and short bursts of animation. 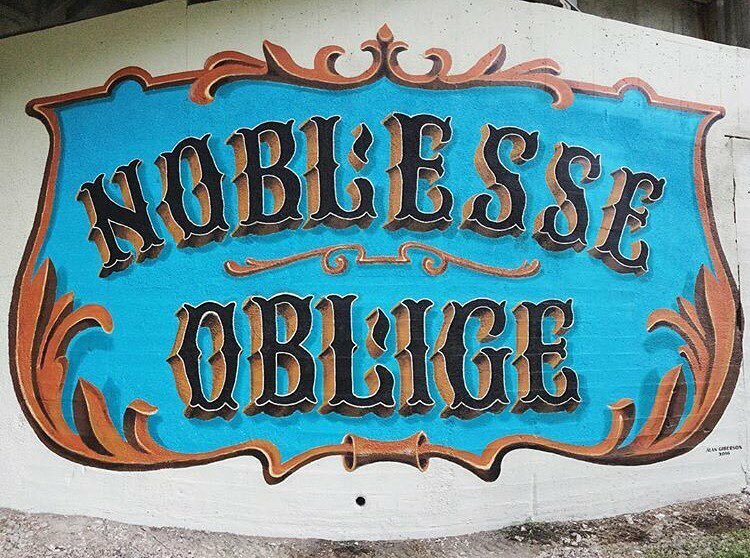 Cleveland artist Ryan Jaenke took Hughes’ melody and translated it to this mural on Cleveland’s west side. Hughes won his Anisfield-Wolf Book Award in 1954. Jasper Wong, Hawaiian artist and co-curator of the Interurban project, explored the themes of luck that featured prominently in The Brief Wondrous Life of Oscar Wao. 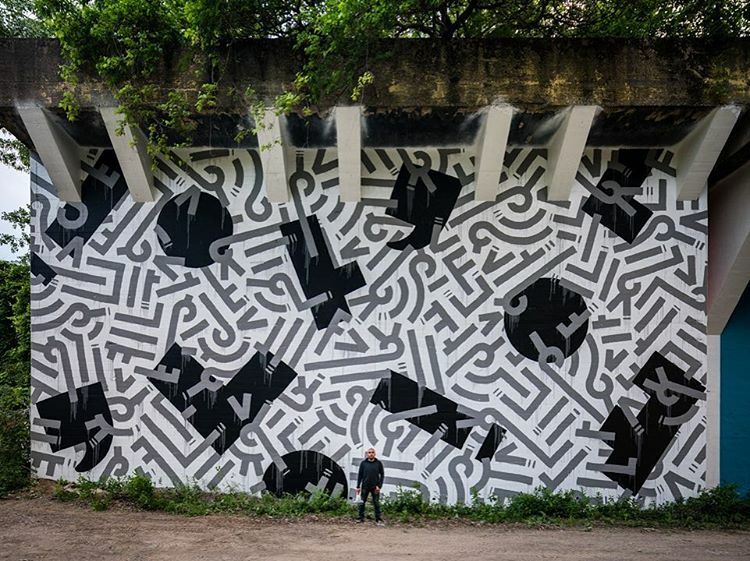 He peppered his mural with black cats and broken down cars (symbols of bad luck) and rabbits (symbols of good luck). 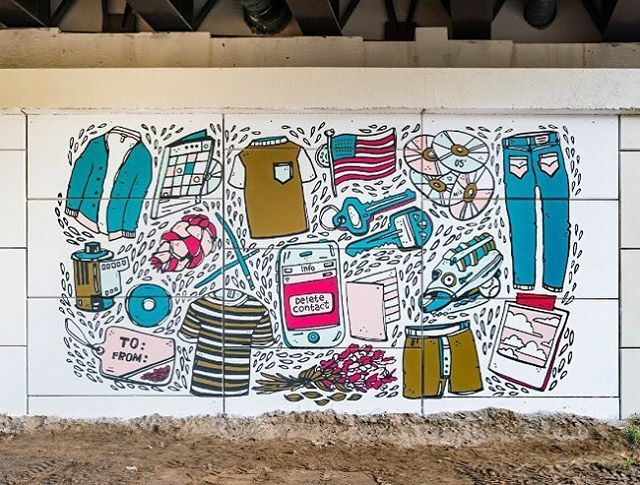 Detroit artist Ellen Rutt used bold geometric patterns to transform these underpass pillars. 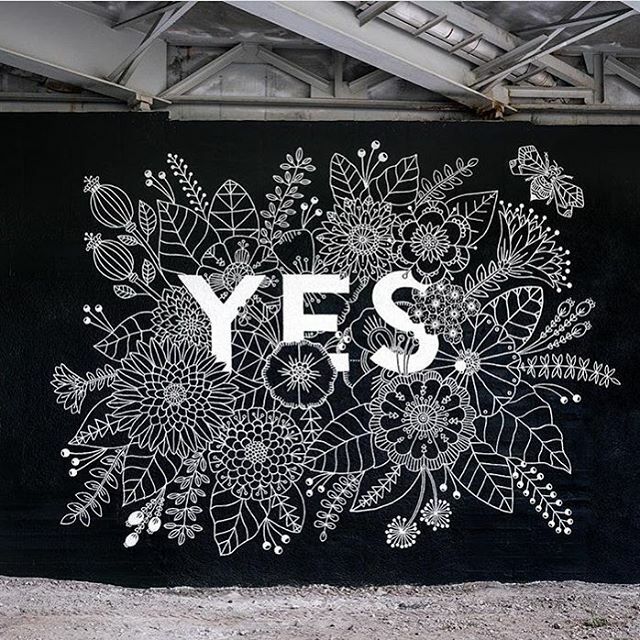 Her “Patchwork Cleveland” mural was inspired by Adichie’s call to avoid “making generalizations about culture based on a singular experience or limited knowledge.” When Rutt moved to Detroit in 2011, she quickly realized the broader narrative about the Rust Belt city was flawed. 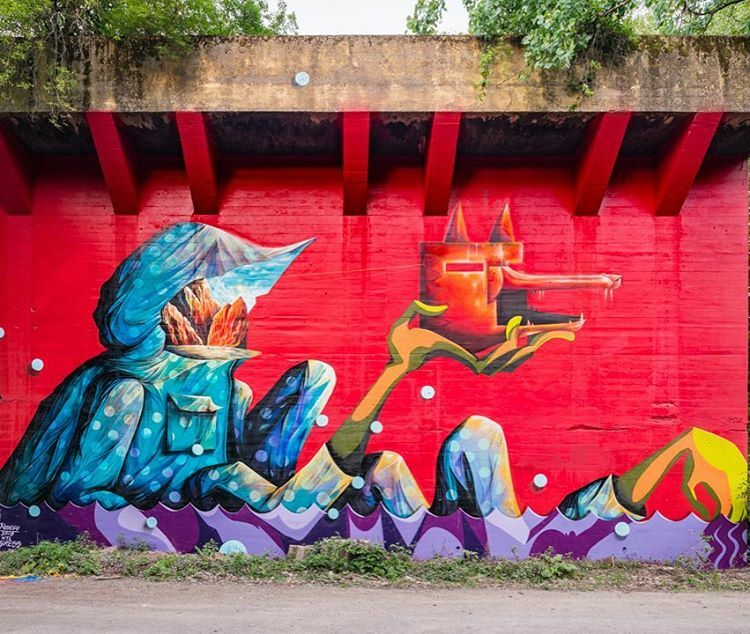 “It was in Detroit, surrounded by amazing street art, that my interest in murals grew from awe­filled admiration, to an unstoppable desire and ultimately, an incredibly important part of my art practice,” she writes. INSPIRATION: Language as a boundary by Wole Soyinka. He won an Anisfield-Wolf Book Award in 1983 for his memoir Ake: The Years of Childhood, and again for Lifetime Achievement in 2013. INSPIRATION: The Boat by Nam Le This short story collection won an Anisfield-Wolf Book Award in 2009. 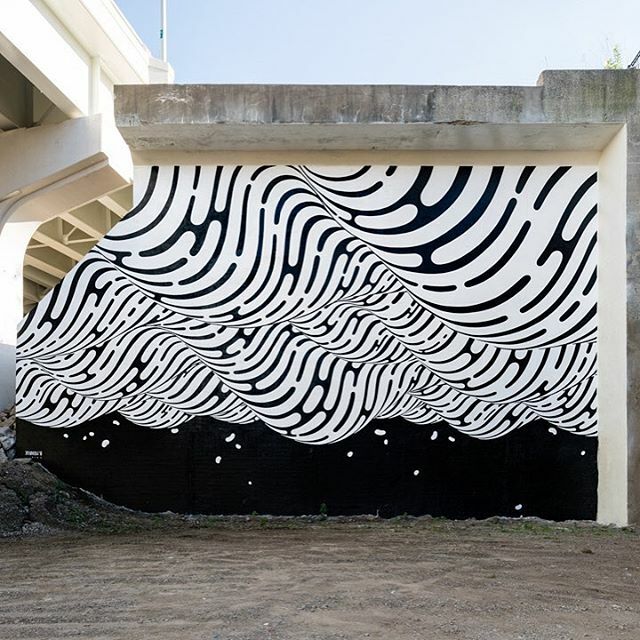 San Francisco artist Brendan Monroe took cues from the dangerous sea voyage in Nam Le’s The Boat as he created this expansive mural. Look closely and you can see a child overboard. INSPIRATION: The short story “5 Dollar Bill” from Dorothy West’s collection The Richer the Poorer. West won our lifetime achievement award in 1996. Tagged: A. Van Jordan, Alex Haley, Chimamanda Ngozi Adichie, David Eltis, David Richardson, Dolores Kendrick, Dorothy West, Elizabeth Alexander, John Edgar Wideman, Junot Diaz, Langston Hughes, Martha Collins, Nam Le, Ronald Takaki, Sandra Cisneros, Wole Soyinka.